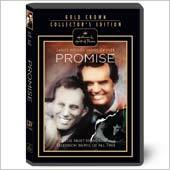 “Promise”, the most-honored movie in television history, is a deeply moving story of family love and loyalty. Bob (James Garner) returns home for his mother’s funeral knowing that he must fulfill a promise made 30 years earlier -- to care for his younger brother D.J. (James Woods), who is schizophrenic. When Bob eventually takes over responsibility for his younger brother’s well-being, he embarks upon the most difficult challenge of his life. Following its premiere in 1986, “Promise” won virtually every award a television program can win, including five Emmys (Best Actor, Best Special, Best Direction, Best Teleplay, Best Writing), two Golden Globes, a Peabody Award, a Christopher Award, the Humanitas Prize and several other honors. The movie remains an enduring favorite in the Hallmark Hall of Fame’s library of films.